As SWP cracks up Morning Star goes Total Tonto. Lessons of History Sadly ignored, says Morning Star top writer. The wisdom of Lenin’s What is to be Done? The cold war and the demonisation of communism further prodded the US and much of the academic and student western European left to distance itself from Leninism. The ABC phenomenon — Anything But Communism — became deeply embedded in the “radicalism” of the late 20th century. A “new” left — purposefully new in order to dissociate from Leninism and cold war ostracisation — sought new forms of radicalism, new approaches to struggle, new types of organisations. Ironically, the new left found answers that had already failed in the past, in the kinds of politics toward which Lenin had earlier targeted his ideological weapons. And today’s US and European left reproduces many of the same tendencies. It has been a common thread weaving through the US left that so-called participatory democracy is the foundation of radical politics and emancipatory or empowering for oppositional movements. From the new left of the ’60s to the Occupy and Indignados movements, this approach has been foundational. The fetish for procedure has not only overshadowed establishing a common programme, but often blocked the achievement of one. Under his pen name the Morning Star leader writer, concludes. What Is To Be Done? 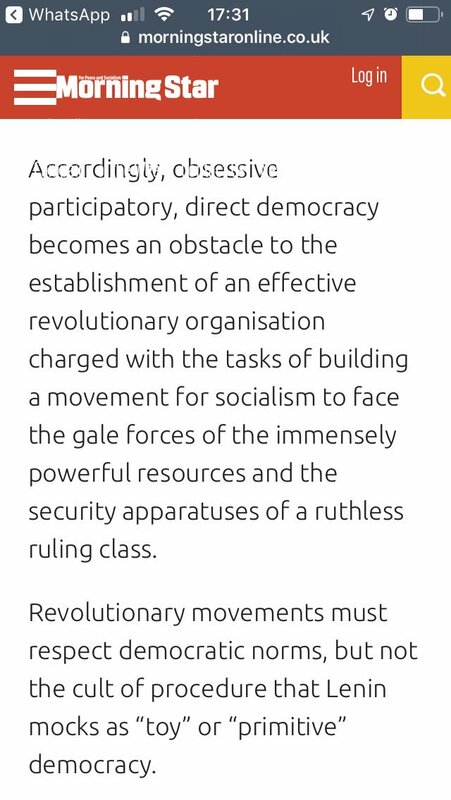 demonstrates the need for a political organisation of ardent, committed revolutionaries, united with a programme to overthrow capitalism. Since the retreat of communism, Leninism has unfortunately been discarded by many on the left. But the wisdom of Lenin’s pamphlet is needed now more than ever. Hal Draper and Socialism from Below. Hal Draper (1914 – 1990) remains a seminal influence on Marxists. Along with Maximilien Rubel (1905 – 1996, probably less known in the English speaking world) he offered a strongly democratic interpretation of Marx and Marxism based on serious historical and textual study. 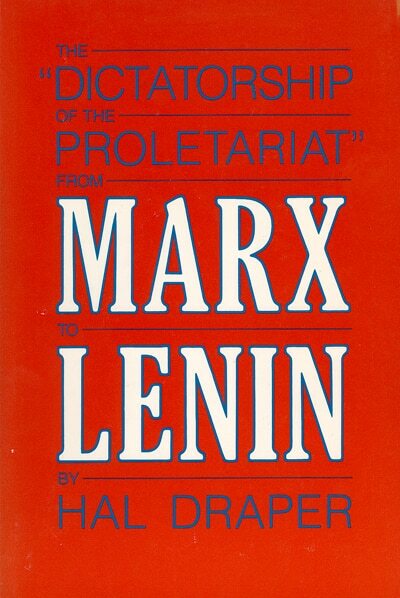 Draper’s unraveling of the historical and political origins and use of the term ‘dictatorship of the proletariat’ (The “dictatorship of the proletariat” from Marx to Lenin 1987) is something many turn to whenever the issue of the Russian Revolution comes up. His Anatomy of the Micro-Sect (1973) while situated firmly within the context of the marginalised US left and, in this Blog’s view wildly and wrongly indulgent towards Lenin himself, offers insights into the way many small left-wing factions operate across the world. In this important article Joel Geier offers an overview of Draper’s contribution to the left and not just on those who call themselves ‘revolutionaries’ or indeed agree with his interpretation of Marxism. The piece is long but this extract gives some of the flavour. Fifty-one years ago the Berkeley Independent Socialist Club published Hal Draper’s The Two Souls ofSocialism.1 Of the hundreds of radical pamphlets published in the 1960s, Two Souls has had perhaps the longest-lasting impact. Appearing at a time when various forms of top-down versions of socialism—social democracy, Stalinism, and Maoism—were in vogue, its emphasis on workers’ self-emancipation set it clearly apart. Moreover, Draper did not merely reintroduce genuine Marxism to a new generation; in its originality and clarity, Two Souls—and the subsequent work that elaborated in detail on his arguments—presented a different way of looking at the world, at socialism, and at competing ideologies. Traditional interpretations maintained that the essential divisions in the socialist movement were between reform and revolution, pacifism versus violence, and democracy versus authoritarianism. Two Souls took a somewhat different angle, namely, that “throughout the history of socialist movements and ideas, the fundamental divide is between Socialism-From-Above and Socialism-From-Below,”2thus introducing the vocabulary, narrative, and ideas of socialism from below as the contemporary representation of revolutionary Marxism. The unifying feature of the many varieties of socialism from above, Draper argued, is distrust or opposition to the working-class’s potential to recreate society based on its own initiative. Socialism from above, Draper specified, is the idea that socialism “must be handed down to the grateful masses in one form or another, by a ruling elite not subject to their control in fact.”3 Distrust of the mass’s ability to rule and denial of democratic control from below are the core tenets of the many variants of socialism from above that have dominated the history of the socialist movement. The heart of socialism from below is the understanding that “socialism can be realized only through the self-emancipation of activated masses in motion, reaching out for freedom with their own hands, mobilized ‘from below’ in a struggle to take charge of their own destiny, as actors (not merely subjects) on the stage of history.”4 These few words summarize what Draper would later work for decades to restore and defend as the heart of revolutionary Marxism in his analysis of the entire body of Marx’s political writings, as presented in numerous articles, as well as in his indispensable, magnificent multivolume series, Karl Marx’s Theory of Revolution (KMTR). A major thesis of Two Souls was that social democracy and Stalinism, the two major self-styled socialisms from above, despite their real and obvious differences, both identify socialism with the statification of the economy, and both reject workers’ democratic rule as the foundation of socialism. Long before Stalinism, Eduard Bernstein, the theoretical father of social-democratic reformism, was the first to revise Marxism to eliminate working-class self-emancipation from its essence, substituting “superior educated” parliamentary representatives for the “uninformed masses” as the agency for socialism. Social democracy and Stalinism, whose advocates strongly denied their similarities, were the dominant radical ideologies that divided the socialist movement during Draper’s political life, which was split between those who supported “democratic” Washington or “socialist” Moscow. These constrained political choices debilitated the working-class movement long before the wrecking operations of neoliberal capitalism began. Read the full article on Socialism From Below in the International Socialist Review. Those who are very far from enthusiasts for Trotsky or ‘revolutionary’ Marxism but who are democratic Marxists have learnt a lot from one of the best socialist writers of the 20th century. Morning Star – Brexit Bolsheviks join “La gauche antimigrants”, the anti immigrant Left. Le Monde has just published a long article on what they call the “anti-immigrant/anti-migrant” left”. A ‘left in favour of national sovereignty and closing borders. The French daily cites the German Aufstehn movement of Sahra Wagenknecht, the “ambiguities” of Jean-Luc Mélecnhon’s La France insoumise, and Danish Labour and ‘populist’ left forces. Lo and Behold the Morning Star, Britain’s leading organ of the Brexit Bolsheviks has just published this (which will appear in the Saturday print edition). The benefits of being free of the EU neoliberal restrictions far outweigh anything else, writes JACQUI JOHNSON. What do we do when we are free of the membership fee and from the jurisdiction of the European Court of Justice? Any of these things is complex, open to offers and counter-offers, stand-offs and compromises, but none overrides the ending of our EU membership. Here is a very prominent ‘benefit’. Leaving means freedom to control our own borders. Immigration policy can be part of a comprehensive employment plan based on equal rights for all who live and work here. The benefits of being free of all of these neoliberal restrictions on our economic prospects far outweigh anything else. Rebuilding and transforming Britain does not depend on trading arrangements, it depends on investment in our people to produce and transform society. You can’t trade if you can’t produce. The anti-migrant writer of this, Jacquie Johnson is former president of NATFHE, now UCU,. She is, by no coincidence at all, linked to the notorious “Trade Unionist Against the EU” – which received funds from far-right millionaire Arron Banks. Brexit offers opportunities we never had while members of the EU. This is now being recognised by almost everyone, even the Guardian. Jeremy Corbyn said, ‘the next Labour government will … [take] advantage of new freedoms outside of the EU to allow Government to intervene to protect our industrial base’. The speakers will explore the opportunities offered by Brexit and discuss how the trade union movement can take part in this most exciting phase in the history of our country. Contributions from the fl oor will be welcome. It is no accident either that one of the most virulent asset-strippers of Greece, former Greek finance minister Yanis Varoufakis, manages to drape himself in “left-wing” colours . He wants to stay in the EU, “but not this EU”). Has the Morning Star Gone Totally Mad as it calls for “Militant Opposition” to “Paedo Gangs’ ? “I can already hear the allegations of Strasserism, of trolling, of “letting the right set the terms of the debate.” says Morning Star Brexit Bolshevik Red Browner Alex Birch. The majority of working-class people oppose the EU, almost all dislike fundamentalist religion and almost all hate paedophiles. They are correct on all three counts. In each case, the left (with honourable exceptions) has failed to indicate its agreement clearly, because it is panicked that these issues are the stamping ground of the right, and that saying what we actually think would give inadvertent support to racists. Instead, the left is derided as the “politically correct brigade” and called “soft on paedos.” How can that do anything but damage our credibility with the ordinary person and provide the right with an opportunity to pose as the only people taking paedophilia seriously? It really isn’t complicated — debunk the racist ideas in circulation around paedophilia, and at the same time make it clear beyond all possible doubt that the left is militantly and aggressively opposed to all forms of it. From Brexit, at the most important level, to backing England in the World Cup, at the most trivial, large sections of the left are abandoning their posts at the first sign of trouble, on subjects and areas of culture that the right have no natural claim to. Alex Birch is an NEU rep and executive member of his Labour CLP….. He has just won the coveted prize for “political confusionist” of the Year. Not Forgetting Stalin. Under Two Dictators. Prisoner of Stalin and Hitler. Margarete Buber-Neumann. “There were twenty-eight men and Betty and I in our group. Betty and I, an old professor and a prisoner with a wounded leg, were taken on in a lorry. The men had to walk. We got out on the Russian side of the Brest Litovsk bridge and waited for them to come up, looking across the bridge into occupied Poland. The men and arrived and then a group of GPU men crossed the bridge. We saw them retiring after a while, and the group was larger. There were SS officers with them. The SS commandant and the GP chief saluted each other. The Russian was a good head taller than the German. Translated into English in 1949 Under Two Dictators. Prisoner of Stalin and Hitler remains a unique account of Stalinism from a victim of the Gulag, and of Ravensbrück. In Karaganda they “slept on the bare ground with our head top the walls all in a line, and about five or is yards in front of us a soldier sat on a stool with his rifle over his knees to see that no one made an attempt to escape” (Page 91) In the Gulag she came across the orphans “produced by the forced collectivisation and the famine.” (Page 116). There was back-breaking work, in freezing conditions during the winter, for a daily pound and a half of bread. Initially the transferred prisoner found the German camp, though grim, was run “with typical Prussian thoroughness” and a higher level of provisions. Nevertheless conditions were harsh. She became a “slave of the Assembly line” in the Industrial Complex, beset with suspicion by Communist prisoners who considered her a ‘Trotskyite’ and “more or less the scum of the earth”. Buber-Neumann was deeply affected when the health of her friend, Jesenka Milena (the recipient of Kafka’s Briefe an Milena) and she died of kidney failure. As the war reached its end Buber-Neumann met Auschwitz prisoners who told her of the mass exterminations. It was not long before the Ravensbrück authorities began to murder the old and unfit in two crematoria. She survived and wandered a devastated Germany. Her memoir ends in a moment of joy as the prisoner of two dictators was reunited with her mother and sister in Thierstein. Buber-Neumann was a key defence witness in the 1949 Victor Andreevich Kravchenk libel case. The author of I Chose Freedom had described the Soviet Union in these terms, “The magnitude of the horror has never been grasped by the outside world. Perhaps it is too vast ever to be grasped. Russia was a battlefield strewn with corpses, blotched with gigantic enclosures where millions of wretched ‘war prisoners’ toiled, suffered and died.” (2) This, and his other works, were attacked by the French Communist Lettres françaises. They criticised it as “fake news”. of”being a traitor, a draft dodger and an mebezzler. His ex-wife appeared as well, accusing him of being physically abusive and sexually impotent. They described Kravchenko as vain, a drunkard, and a “traitor” to the USSR. “He had fabricated the book’s material with the help of US disinformation services, and was himself a creation of the American secret services. The growing evidence – Rousset was able to cite the Russian penal codes own punishments – told. The Communist journal lost both the cases and was condemned for defamation. The result was a public controversy that swept the left. It undermined the influence of the Parti Communiste français (PCF), above all amongst the reading public. The Gulag and the Left. The debate about the existence of Soviet camps was far reaching. Were these just crimes of Stalin? It raised again the Soviet-German Pact, the backdrop of the decision to send Margerte Buber-Neumann from one universe of camps to another. What means could be justified (as already discussed and decided largely in Communism’s favour by Merleau-Ponty in Humanisme et Terreur. 1947) in terms of the eventual “goal” of equality and freedom? Was the Gulag, far from disappearing with victory in the Second World War, an essential pillar of a system? The French left – in common with other lefts – has since that time been shaped by the fall-out from different stands on these issues. After an initial discussion about whether the Soviet system, which left at least some people alive, was better than the Shoah, a debate, which has yet to conclude, on the nature of the USSR began. The place of forced labour and mass murder at the heart of Stalin’s USSR – was perhaps the most decisive. Claude Lefort, who considered that Moscow’s ‘totalitarian” regime rested on forced labour and repression of dissidence, fell out with others in the leading intellectual left journal of the time, Les Temps Modernes. He, and Cornelius Castoriadis, in Socialisme ou Barbarie, argued that the French Communists, did not just defend the Soviet Union against all comers, but would try to inflict these practices at home. They were a junior part of the same bureaucratic exploiting class. Other did not and do not consider tyranny and murder to have been the motor of the USSR, but as part of a historically contingent wrong course. Some, even Sartre for a time, thought that the world Communist movement was the only hope for the future whatever regimes and parties may have been at the present. Many of the independent French left while wary of the Communists, pointed to their strength amongst organised labour. They refused to reject their policies en bloc. Orthodox Trotskyists continued to consider that the fundamentals of the USSR, state ownership, were, for all the bureaucratic pile up, privileges and repression, sound. One can find the same positions across the world’s left. Coming to terms with the Fall of Official Communism remains a central difficulty for the left. Today, in Britain, all that remains of an already small Communist Party of Great Britain (with some influence in the trade unions and intellectual life) is a minuscule Communist Party of Britain (CPB) and ultra-Stalinist fragments. But there is a more diffuse legacy from those who supported Soviet Union, that continues within the labour movement. Some on the left have not come to terms with the basic facts about Stalinist crimes. Key figures around the Labour leader promote a Boy’s Own view of Stalin, as, if nothing else, a dashing and successful War Leader. 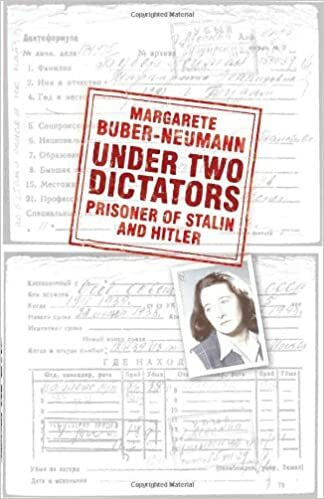 Margarete Buber-Neumann reminds us that Stalin’s darkest side was there at that very moment. (1) Page 143. Under Two Dictators. Prisoner of Stalin and Hitler. Margerte Buber-Neumann.1949 Pimlico. 2008. (2) Page 303. I Chose Freedom. Victor A. Kravchenko. The Personal and Political Life of a Soviet Official. Transaction Publications. 2002. (3) Pages 351 – 360. La Révolution rêvée. Michel Surya. 2004. Red Famine, Anne Applebaum. Stalin’s War on Ukraine. A Review. Red Famine, Anne Applebaum. Stalin’s War on Ukraine. Allen Lane 2017. Anne Applebaum totals 5 million who perished in the Holodomor (Hunger-extermination in Ukrainian) alone. This mass starvation was a “famine within the famine, a disaster specifically targeted at Ukraine and Ukrainians.”(Page 193) In this the author of Red Famine follows Robert Conquest who considered that the deaths were deliberately inflicted for ethnic reasons and constituted genocide (The Harvest of Sorrow. 1986). More recently Timothy Snyder has called it “premeditated mass murder” (Bloodlands. 2010). Spurred by the prospect of national, notably urban, food shortages in the late 1920s, Stalin, Applebaum observes, ordered the programme to ensure “internal accumulation” for Soviet industry. The peasants were driven into Kolkhozes, collective farms, and the “liquidation of the Kulaks as a class” met resistance. By the end of March 1930 the secret police, the OGPU recorded 2,000 mass protests in Ukraine alone. The response was coercion. Teams of ‘activists’ herded people up, lectured them, poked their noses into their meagre belongings, and confiscated at their whim. Armed Soviet agents surrounded rebellious villages with machine-gun and forced them to surrender. There were mass deportations. The Marxist Deutscher compared the fate of the peasants to that of “mere factory hands”. In the USSR this meant life ruled by party appointed bosses, internal passports, and military discipline. They did not welcome their new lives. In the collective farms, badly supplied, and ramshackle, people worked as little as possible. Vast tracts of land were “left untilled”. The reduction of the independent peasantry to appendages of the state bureaucracy, and the deportation of the slightly better off kulaks, took place against the backdrop of famine. From exhortations, backed by violence to join the Kolkhozes, the state focus shifted to procuring food. The quest for gain through forcible requisitions became a prime activist task. Bringing back memories of marauding armies in the Civil War, appeared “a man who brandished a gun, spouted slogans and demanded food”. By the winter of 1932 –3 people in the countryside had exhausted their supplies and started to search for “everything edible”. Many were unable to find anything. There were harrowing incidents of cannibalism. The result was that, demographers estimate, 4,5 million people starved to death. Red Famine states that there was policy behind the disaster in Ukraine. Stalin was hostile to Ukrainian nationalism, from the 1917 Rada onwards, and Ukrainians, including their own Bolsheviks whom he believed favoured the national movement and culture. This had a basis in that millions of Ukrainian peasants had wanted “a socialist revolution, but not a Bolshevik revolution” and distrusted anything that came from Moscow. If those with such views in the villages could be sorted out by direct force, the intelligentsia presented another obstacle to be met with by the same methods. Beginning with Stalin’s consolidation of power all signs of national consciousness were repressed; above all, the educated Ukrainian speaking elite were targeted in successive purges. Stalin, while adept at claiming a certain distance from those “dizzy with success” I applying his decrees never admitted any responsibility for the deaths in the early 30s Apologists such as visiting French Minister Édouard Herriot, concerned to make a treaty with the USSR, and the US reporter Walter Duranty aided his work. 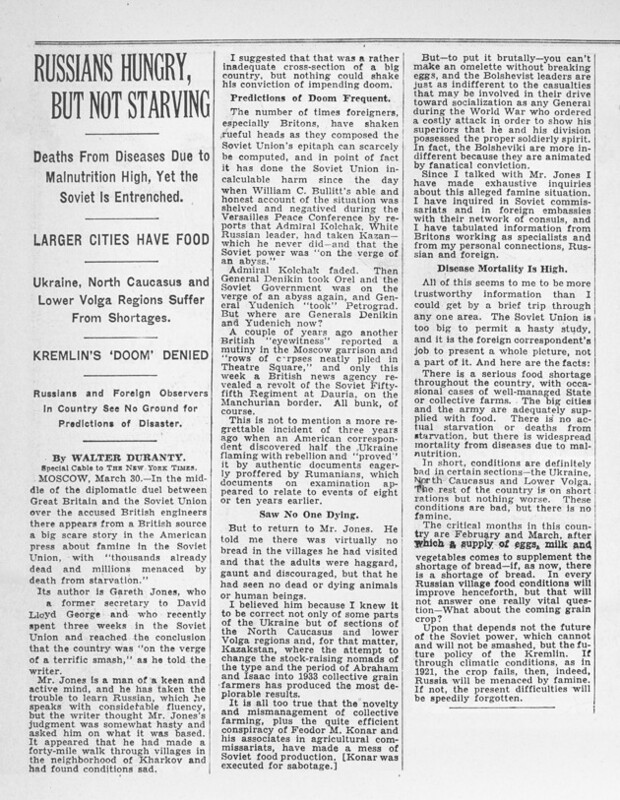 The Pulitzer Prize winner replied to evidence of famine from the young journalist, Gareth Jones, with the headline, “Russians Hungry, not Starving.” The facts reached only a limited audience. Not only was there no international movement of protest, but the Soviet Union neither appealed for helps from other countries, nor set up its own relief operations. To talk of the wretched conditions of the victims was a crime. If Stalin did not seek to eliminate all Ukrainians, but the “the most active and engaged Ukrainians, in both the countryside and the cities” was this a crime of genocide? It is distressing to broach the issue. The reader, shaken by this book, can only express humility towards those determined to commemorate the Holodomor and a wish to stay clear, very clear from those who still attempt to rehabilitate Stalin’s rule in the USSR and slander the martyred Ukrainians. (2) Le paysan soviétique. Boris Souveraine. In Cauchemar en URSS Paris, Revue de Paris, 1937. (3) Pages 324-5. Stalin. Isaac Deutscher. Penguin. 1990 (1949).